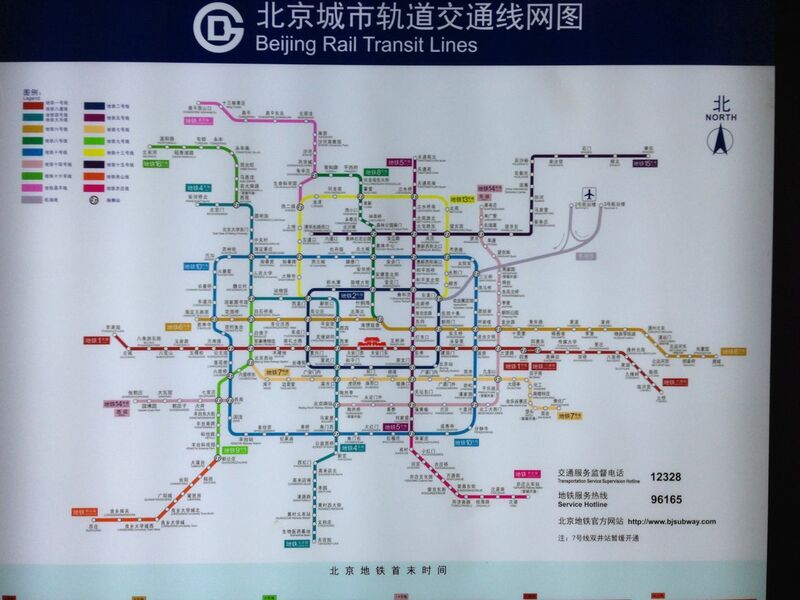 When I arrived in Beijing in 2007, there were maybe three subway lines -- Line 1, Line 2 and Line 13. By the time I left three years later, there were perhaps seven lines. Now there are some 15 lines. This is the most updated map that's found in the city's subway stations. I met a friend for lunch whose office is near Beijing West Railway Station on the new Line 7. She asked me to meet her at Wanzi station, the stop before the railway station. 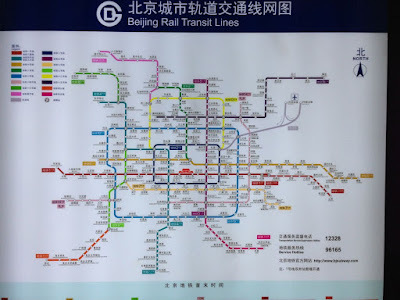 So from Dongsishitiao, I went south on Line 2 until I reached Chongwenmen, then transferred to Line 5 down one stop to Ciqikou, then transferred again to Line 7 going west. Transferring from one line to another can entail a pretty big trek that could be over five minutes long, going down a long tunnel then up some stairs and then down to the platform. Examining the subway map further, you can see many of the lines are actually a few stops just so that a commuter can transfer to another line. Imagine having to transfer from one end of town to the other -- the maze of passageways to go through everyday must entail a lot of exercise to say the least! After lunch with my friend I went back down to Wanzi station and was surprised to find that not only did my bag go through the X-ray machine, but I was also being checked over with an electronic paddle!